Massive crewless vessels could soon set sail to save money and improve safety at sea ? Remote-controlled ships used to come wrapped up as presents under the Christmas tree, but if European researchers and one of the world’s best-known engineering groups have their way, full-size versions will start replacing much of the tonnage afloat on the high seas in the coming years. There are plenty of compelling reasons to switch to crewless ships. But the main driver for Oskar Levander, head of marine innovation at Rolls-Royce, is cost. A ship that does not have to accommodate a crew for weeks on end can dispense with many if not all the life-support systems needed by humans, from the galley to the sewage treatment system, the accommodation area and the deck house. Removing these would not only leave more space for cargo but would also mean lighter ships, holding out the prospect of big savings on fuel bills, which account for about half of a ships total operating cost. Mr Levander says crew expenses vary but can range between 10 and 30 per cent of operating costs. 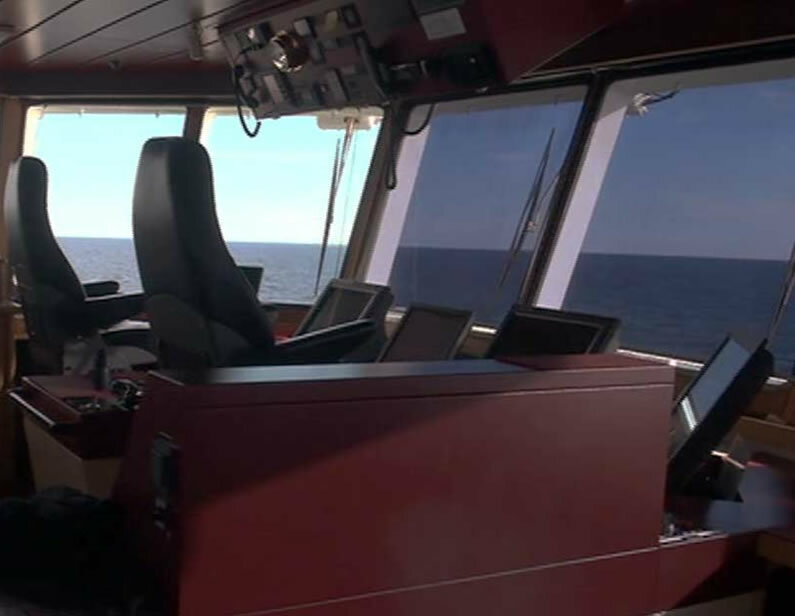 He envisages a shore-based team of qualified captains working in a replica 3D bridge, similar to the simulators used for training today, that could operate a fleet of a dozen ships at the same time. A European Commission-financed academic research project, dubbed Munin also suggests an autonomous ship would be safer. It found that 75 per cent of maritime accidents can be attributed to human error and “a significant proportion of these are caused by fatigue and attention deficit”. Technology could readily take over tedious and repetitive human tasks such as watchkeeping at sea. The technology to design such a vessel already exists, argues Mr Levander. Global communications satellites have the power to provide enough bandwidth to navigate the vessels remotely using feed from onboard radar and cameras. 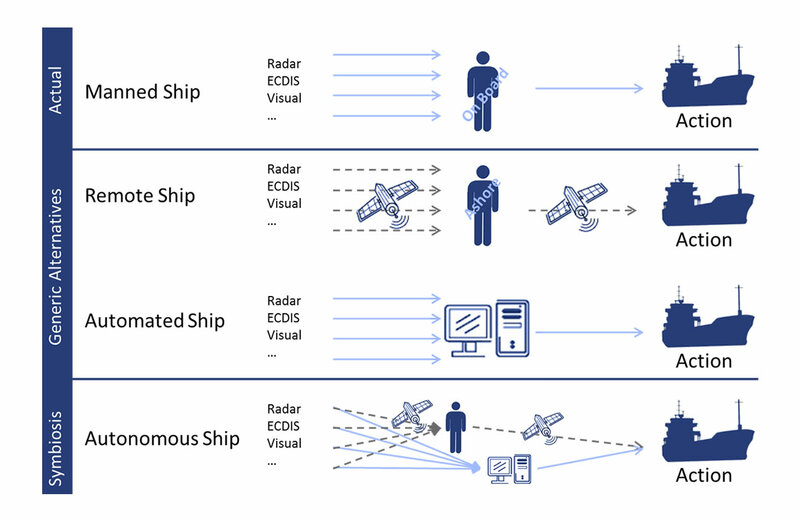 Ships already navigate automatically using GPS technology and onboard cameras are used to enhance human vision in poor visibility and to spot objects in the water, far beyond the range of the human eye. Piracy, a constant threat to crews in many parts of the world, could also be more effectively countered. Mr Levander says with no crew to take hostage the vessel would be less attractive. But more importantly, without any people onboard, a ship could be fitted with countermeasures, such as flooding the ship with a gas that incapacitates anyone who boards without authorisation. Described by developers AAI, MRVI and Sea Robotics as a fourth-generation unmanned surface vessel (USV) that can be remotely operated and function in fully autonomous missions, the Interceptor was displayed in public for the first time at IDEX 2007 in Abu Dhabi. The USV is designed to operate in concert with UAVs to provide an unmanned defence and maritime security surveillance solution. The Interceptor is 21.6 ft long with an 8 ft beam, a top speed of 55 mph, 24-hour endurance and a range of up to 1,000 nautical miles. But Peter Hinchliffe, secretary-general of the International Chamber of Shipping is more circumspect. He says the highly complex collision avoidance rules would have to be rewritten to allow autonomous ships to operate in the same environment with crewed ships, a change that could take decades to implement. He is also sceptical about whether the bandwidth is available to remotely operate the vessels, given how much would be consumed by video and radar feeds alone. And even if it is possible he questions whether the costs would make it prohibitive. Mr Hinchliffe also argues that extra redundancy and back-up systems that would be needed, in case something fails at sea, raise questions about the promised weight savings. But one thing he does agree with Mr Levander on is that it is becoming increasingly difficult to find people to go to sea. The romance has gone out of life on the ocean wave, it appears. “In the 1950s and 1960s people used to go to sea to see the world. It is not that easy to find young people to go to sea today. They would rather be at home with their friends and travel for leisure instead,” says Mr Levander.